I recently started a new series on the blog, Trying Cult Beauty Brands For The First Time and you all seemed to really enjoyed it so here I am back with another. Read the first instalment here where I talk about a few products from the Balm and Beauty Blender, two amazing brands I now understand what the hype is about. Today, I wanted to try my very first eyeshadow palette from the brand Huda Beauty and see whether I've been missing out or not (spoiler alert, I have!). I'm sure you've heard of it before but in case you've been living under a rock for the past 2 years or so, beauty sensation Huda Kattan launched an eponymous range of award-winning beauty products and has quickly become a global phenomenon. Ranging from all things make-up to skincare and even fragrances, Huda Beauty brings some of the best eyeshadows in the market, trendy lip kits, amazing falsies and is now dipping its toes in base products too like its fairly recently released foundation and concealer, both of which I have on my wishlist. To commence this new beauty journey for me and given my brother was in Portugal where there is a Sephora in every corner, I asked him to pick me up possibly one of the most sold products the range has, a mini obsessions palette, more specifically the Mauve Obsessions palette. Read on to see what I think about it! 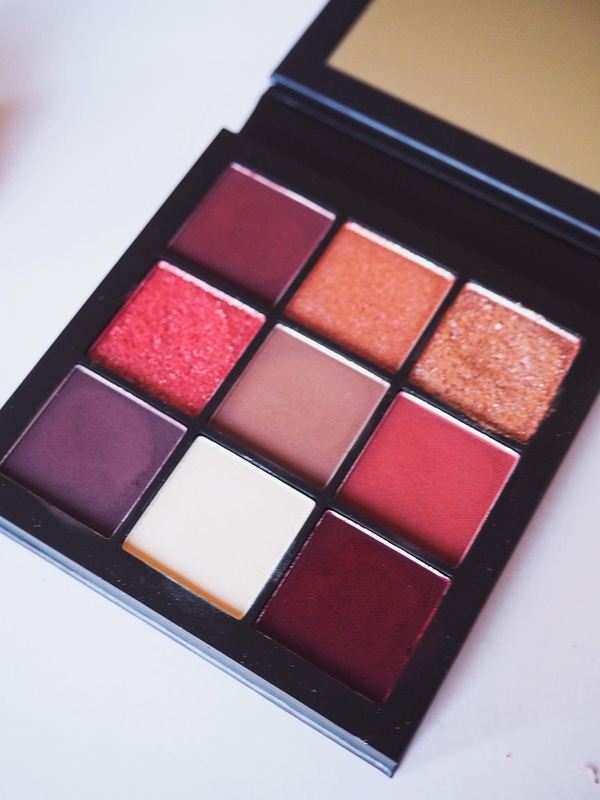 Following the frenzy of her cult Rose Gold and Desert Dusk palettes, Huda Beauty released Mini Obsessions palettes featuring nine essential colours said to suit every individual style. Considering I had way too many neutral shades in my collection already I opted for Mauve Obsessions (instead of the Warm Brown), built up of plums, reds and molten metallic hues, which are some of my favourite colours for autumn and winter. 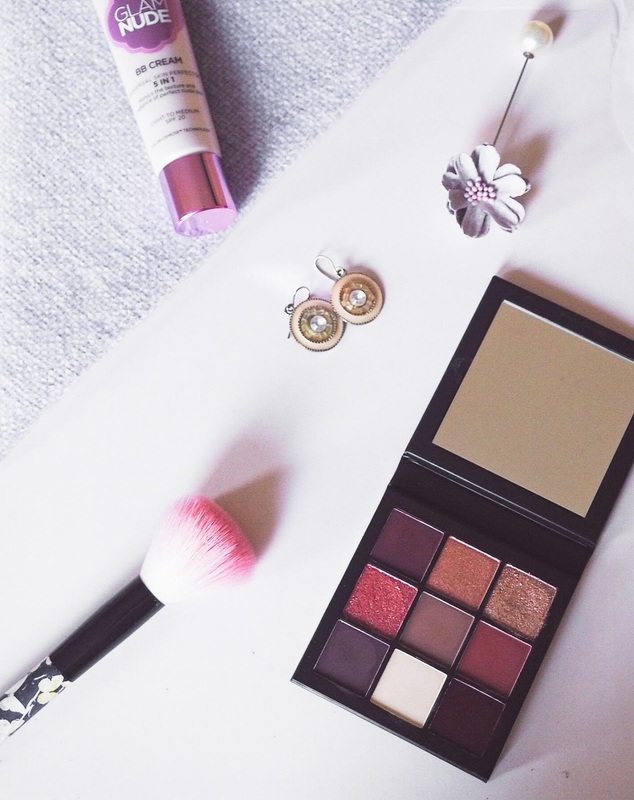 The Mauve compact is said to have everything you need to create smouldering eye looks that can be both dialled down and amped up and with the shade range, I knew both day and night looks would be possibilities. When I first opened it, yes it was small (hence the name "mini") but that didn't put me off too much. It seemed like a great travel-friendly palette and I was far more interested in what was inside. 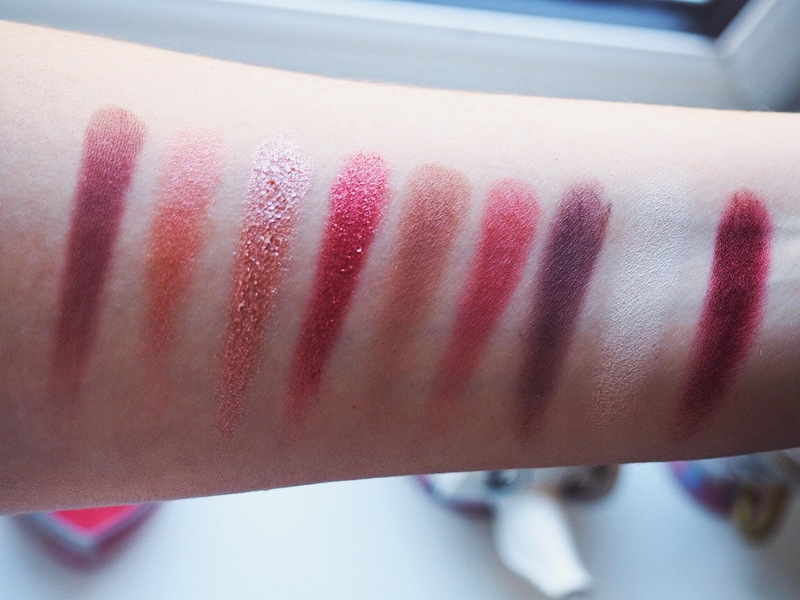 And as you can see from the swatches below, this stuff is incredibly pigmented. I'm not usually used to play with such high pigmented shadows but I needn't have to worry, blending was effortless, the fallout was minimal and the colour payoff was just truly gorgeous. I am particularly impressed at how there isn't one dull shade in my palette (because you know there always is at least one), even the matte white shows up pretty nicely and does a great job as a base shade to intensify some of the other shades. The mattes are buttery and easy to work with, the middle shade is the perfect transition colour for the grease to create definition and the darker shades work amazingly well on the eye outer corners to create depth and as eyeliners. The real winners though are without a doubt the metallic hues and I can honestly say, I have never seen such pigmentation on these types of shadows before. The third shade, in particular, is not just stunning but looks incredible in a cut crease and will allow me to create not-for-the-faint-hearted eye looks, ideal for the fast approaching party season. I truly hit the nail on the head and got my hands on this beauty at the perfect time of year! All in all, I can truly say these are some best shadows I've worked with. To be the first product of the brand I try, I think I've chosen really well and I am tempted to add some of the other Mini Obsessions palettes to my collection, especially with Black Friday discounts coming up. 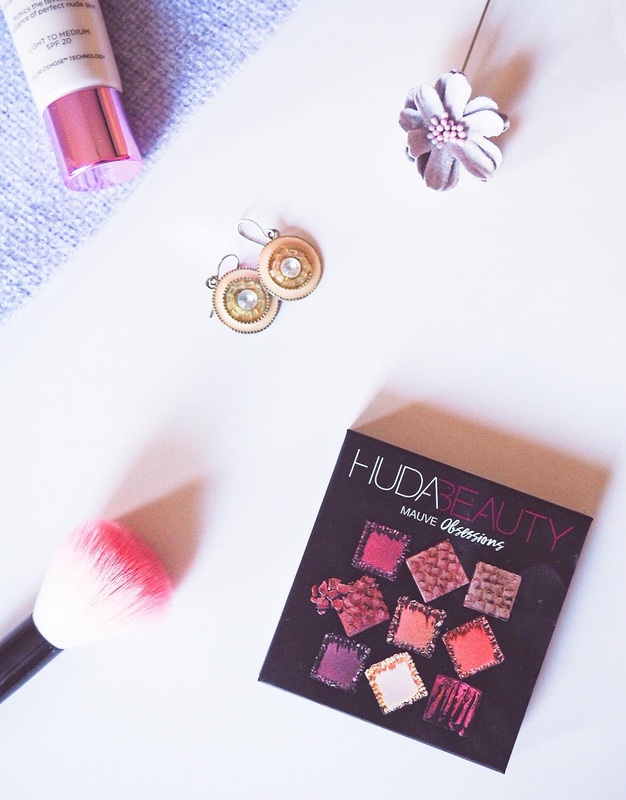 Have you tried anything from Huda Beauty? I'd love to hear some suggestions on what to try next, so let me know below! Thanks for reading beauties, and wishing us a great rest of the week! Huda Beauty products are definitely on my wishlist! same here. I used to swear by UD but these may have stolen that spot! Huda Beauty is definitely upping the game and the eyeshadows palettes are generally love by everyone. I really wanna try their face products now too! It's good to know that you were impressed! Fun colours too! This is such a great series and I hope you continue it! thank you so much! will do so! adorei as cores. que lindaaa! they are amazing and I definitely want some more! I’m happy to read this blog post and come to know more about that. Thanks for share with us. Cheers!